Miniature Chamber Pot, White china, 1.5"
One miniature porcelain dollhouse doll in 1:12 scale. I've created him in a peach cream colored porcelain and his face and shoes are china painted, making this doll a long last collectible. His hat is removable. This delicate swan is crafted from porcelain. Perfect for your dollhouse floral needs. This item is an adult collectible. It is not a toy; it is not intended for children under 12 years of age. A Problem or Concern?. BEAUTIFUL fine, thin porcelain tea service made and hand painted by Australian artist Beate Wickert. Signed "BEATE'S" on the teapot. Ethel Hicks Porcelain Doll "Ida Mae": DOLLHOUSE. This is a perfectly darling, tiny porcelain (head, arms and legs) dollhouse doll's doll, handcrafted in dollhouse (1:12) scale by Ethel Hicks of "Angel Children" miniatures. ARTIST BETSY ROUSE ONE OF A KIND HANDCRAFTED FRENCH MINIATURE PORCELAIN DOLL. DARLING PORCELAIN HAND PAINTED FACE WITH PALE BLUE EYES & FRECKLES, SHE HAS BLONDE SPIRAL CURLS-PORCELAIN ARMS & WHITE LEGS & PAINTED BLACK SHOES-HER ARMS AND LEGS ARE PERFECT NOT LOOSE. (DOLLHOUSE MINIATURE ARTISAN JOAN BENZELL "Amanda" "Joans Bisque Bebe's" porcelain doll kit. Includes completed wigged head, arms, legs, slong with directions on how to complete the doll by Joan. Sweet doll :) Brunette/Auburn hair. I handcrafted these in my studio and decorated them with kiln fired gold. This item is an adult collectible. It is not a toy; it is not intended for children under 12 years of age. A Problem or Concern?. Flower on the sides and a Rooster on the lid LOOK hand painted but are a transfer pattern. Unsigned ~ made in France. Adorable Artisan Handmade Porcelain Doll dressed in Blue. 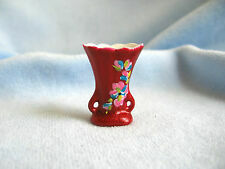 DOLLHOUSE MINIATURE ARTISAN LOVELY LADY IN BURGUNDY AND LACE ON A PEDESTAL BASE/ STAND, NOT FEET. EASY TO STAND WHERE YOU WANT WITHOUT A DOLL STAND. LOVELY DRESS AND FACE! I respond as quickly as possible. This was poured from a Joyce Wolf mold "Celeste". She has been painted, the head/torso, toenails on her feet and finger nails. This doll has her eyes closed and she is yawning. Her hands are closed fists. Artisan Kay Lewis Dollhouse Miniature Yellow Bird in Tree Bush 1:12 Scale. Lovely yellow bird landing in a bush with yellow berries. Delicate and in excellent condition. Up for sale we have a gorgeous porcelain doll by the artist Dorothy Haw. Simply charming in her I Love Minis apron perched upon her stool with art project in hand. She is signed by the artist and a great example of her work. Hexagonal porcelain tea pot standing on six legs has a wire handle and removable lid with Asian character writing on it (possibly artist's signature?). Hand painted cobalt blue Lotus flowers, vines and leaves. This is a dark blue collection of matching porcelain, hand painted by Christopher Whitford (signed). This is very, very detailed and well executed. This is on porcelain by Donna and Keith Brown of Avon Miniature of the UK Signed. She is in a fixed position. She is in my estimation in excellent to very good condition. This is a reclining cat by Jennifer and Herb Bennett (signed JHB). This blue and white kitty sports a bow and flowers. This is Dollhouse Miniatures Porcelain & Cloth Body Girl. She is 3 3/4" tall and her head, part arms and legs are porcelain and the middle body is cloth. She is bendable. She is used and in very good condition. NEAT porcelain pitcher in the shape of a Shar Pei dog (the mouth is the spout :o). This is Dollhouse Miniatures Porcelain & Cloth Body Woman with Stand. She is 5 1/2" tall and her head, part arms and legs are porcelain and the middle body is cloth. She is not bendable. She is used and in very good condition. It has a hand-painted windmill on it. It is in my estimation in excellent to very good condition. Ethel Hicks Porcelain Doll "Arissa" (2" Tall): DOLLHOUSE. This is a perfectly darling, tiny porcelain (head, arms and legs) dollhouse doll's doll, handcrafted in dollhouse (1:12) scale by Ethel Hicks of "Angel Children" miniatures. This is standing kitty was made many years ago by Jennifer and Herbert Bennett. This Blue and white porcelain cat is nattily dressed in polka dots and a tuxedo bib. This is a lidded jar/ginger jar, handmade by Jim Clark (signed and dated 2010). This is beautifully proportioned and the cross hatching is very well done. Dollhouse 3/4” Miniature Piggy Bank Created And Signed by Jane Graber. Rare and sought after by collectors of miniatures. This beautiful porcelain 1:12 scale little girl wears a frothy dress and has soft blonde curls. This is a Bespaq Side Table and a porcelain Tea Set. These are in excellent condition. The table has beautiful carved details on the legs. The bottoms of the feet have little brass fittings with wheels, so that the table can roll on the feet. DOLLHOUSE PORCELAIN ROSE DRESSER BOX-BEDROOM /BATH ACCESSORY,TINY CANISTER 1/2"
This tiny covered box was crafted in my studio from porcelain. This item is an adult collectible. It is not a toy; it is not intended for children under 12 years of age. It stands about 1/2" high to the top of the removable lid. Up for sale we have a charming porcelain doll with her parasol. She will need a stand. Her hat is attached but her parasol is not. She is in excellent condition and superior quality and would make a great addition to your collection. This was poured from a Joyce Wolf mold "Dawn". She has been painted, the head/torso, toenails on her feet and finger nails. This doll has her eyes open and her head is slightly tilted back. There is a body pattern, and simple pattern to dress her. Dollhouse Miniature Porcelain Toy Doll 1"
Her arms can move but her legs are in a fixed position. She is my estimation in excellent to very good condition. This is a perfectly darling, tiny porcelain (head, arms and legs) dollhouse doll's doll, handcrafted in dollhouse (1:12) scale by Ethel Hicks of "Angel Children" miniatures. This little angel stands 1 5/8" tall.